Easiest and tastiest pork chops I have ever made. Well, maybe not the best like the best in the world, but definitely a keeper since they are so easy and so fast to prepare. It may sounds impossible, but the taste is almost like a cross between char siew and siew yoke, it’s almost unbelievable. Give it a try if you are a fan of either one of the two Chinese delicacies. Actually, give it a try even if you have never tried char siew or siew yoke, you won’t regret it. To ensure that the cooking time will be fast, I thinly slice the pork chops. The standard thickness of pork chops I bought in the States is usually about 1 inch thick, and I cut each into three equal slices, then I further flatten each slice slightly with the back of a knife which tenderizes it at the same time. By the end of it I ended up with thin slices of roughly 1⁄4” (~ 1⁄2 cm) thick. 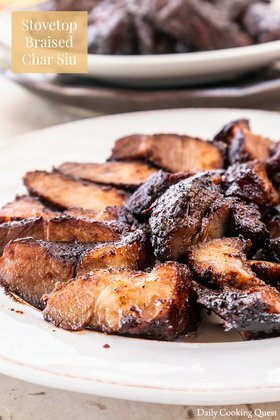 The thin slices ensure that the pork will be well marinated even with a marinating time of just 30 minutes, plus they cook in no time at all, about 1-2 minutes per side is more than enough, definitely try to flip under 2 minutes or the meat will be tough. Cut each slab of pork loin into three equal slices. Tenderize each slice with the back of a knife/cleaver. You should end up with 9 slices of pork loin. 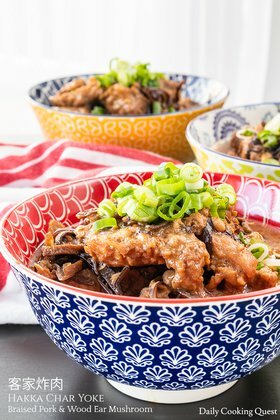 In a mixing bowl, marinate the pork slices with light soy sauce, sweet soy sauce, and gently massage the dry rub into the meat. Let the pork marinate for 30 minutes. Heat 2 tablespoon of oil in a frying pan/skillet on medium-high. Fry both sides until slightly charred and caramelized, up to 2 minutes per side should be enough. Let the cooked pork cool slightly, about 10 minutes, then cut into thin strips and serve with steamed white rice.